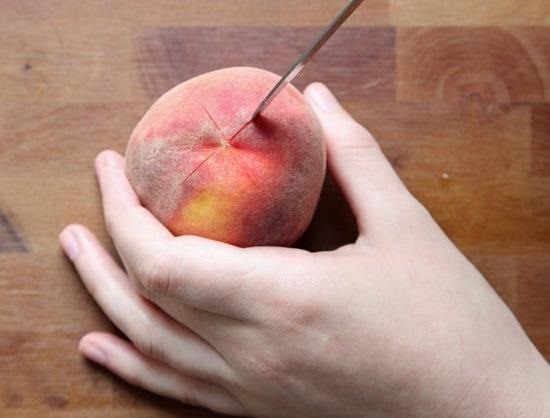 Peeling any fruit with a super thin skin like peaches, nectarines, and tomatoes can be difficult because the peel just rips into a thousand tiny pieces. It's not so bad if you only have to peel one piece of fruit, but if you're prepping for a dish or dessert that requires a bunch of them, it can get pretty time consuming. To cut your prep time in half, try this tip from America's Test Kitchen—submerge the fruit in boiling water to help loosen the skin. 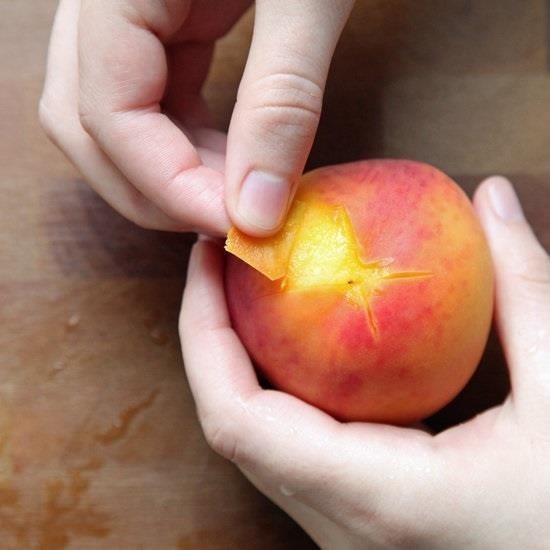 First, use a paring knife to score an X on the bottom of each piece of fruit. You don't want to cut into the flesh, just the peel, so make the cut as shallow as possible. Lower the fruit into boiling water until the skin starts to loosen around the score marks, then pull them out and put them in an ice water bath to stop the cooking (this is crucial unless you want mushy fruit). The peel should now be easy to pull away with your fingers. How Long Should You Blanch Them? The length of time you should leave your fruit in the boiling water depends on what you plan to do with it. America's Test Kitchen recommends about 2 minutes for peaches that are going to be cooked anyway in a pie. If you want them raw, though, 30 to 40 seconds is long enough to loosen the peel without cooking the fruit. This little trick also works great on tomatoes and potatoes, and there's even a microwave variation for peeling garlic cloves. Know of any other great tips for peeling fruits and vegetables? Let us know in the comments below.